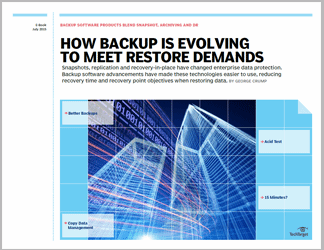 This chapter is included in the Navigate backup, disaster recovery and archive convergence E-Book. The purposes of data backup and archiving are quite different, as are the demands each technology places on the storage system. But most data centers, especially those in small to medium-sized organizations, don’t have formal archiving strategies, and given the capabilities of modern backup software and hardware, they may not need one. The primary responsibility of backup is to restore the latest copy of data back to production storage as quickly as possible. The primary responsibility of an archive is to store data for a long period of time. Today, there is an authentic convergence of backups and archives -- people are seeing them as complementary. 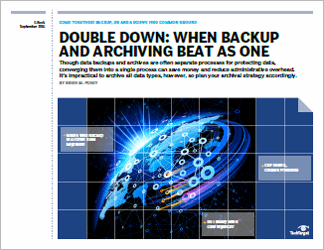 Not only are backups and archives planned as parts of a single data protection strategy, but both sets of data are increasingly stored within the same protection-storage container and even sometimes managed by one team. 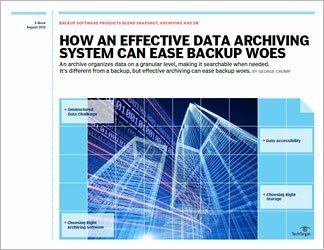 The convergence of backups and archives comes with benefits -- reduction in capital and operational costs as well as simplification of IT processes -- but also challenges, such as making sure that the software can perform the task, and readability of the backup and the archive. The decision to merge data backups and archives often depends on the size of the archive. How much data needs to be retained and for how long? In this E-Book chapter, find out if the convergence of backups and archives will work for you, and learn about products that are facilitating this union.